Harvest House Bed & Breakfast is conveniently located in the restored Rice Hotel Annex, across from Evan’s Park, in downtown El Campo, Texas. 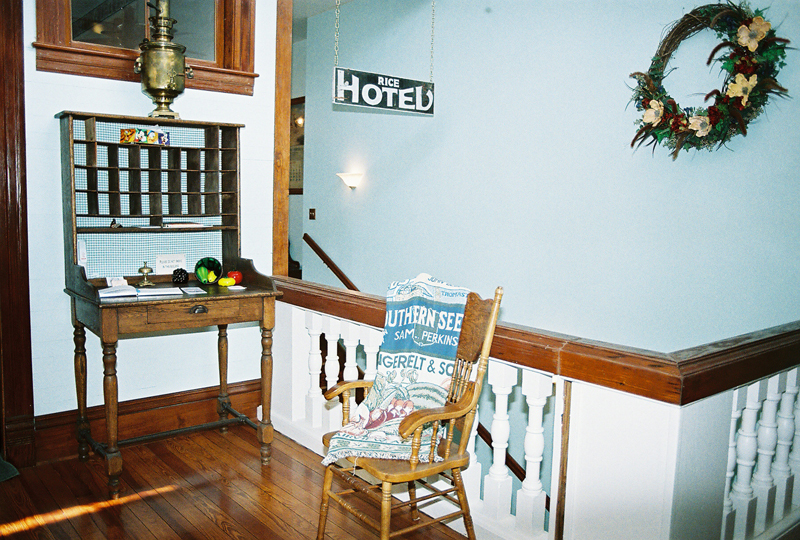 The Rice Hotel, which was originally built in 1898, served as a thriving gathering spot for the growing community of El Campo. In 1911 an annex was added across the roofs of four existing businesses to accommodate the growing community’s needs. Harvest House has turned four of those rooms into beautifully restored bedrooms with antique bedroom furniture, antique lamps and custom designed hand-stitched quilts, harvest themed murals and coordinating wallpaper borders. The eclectic decor of the 1920’s and ’30’s was chosen for the beauty of the Victorian influence and the simplicity of the pre-Depression American style. Our guests have an abundance of dining options available eight restaurants within walking distance. Looking for a nice, relaxing getaway? CALL (979) 578-0062 OR SEND US A MESSAGE! Local Attractions: El Campo Museum, Mural Trail, Antique Shops, El Campo Aquatic Center, El Campo Bowling Center, El Campo Country Club & Golf Course, Showplace III Cinema, El Campo Civic Center and more! Spacious 12-foot ceilings, ornate window and door molding and hard-wood flooring have been painstakingly restored to their original beauty. The modern convenience of central air and heat, as well as a central gathering parlor, complete with cable television and VCR, make our guests feel right at home. The central parlor is perfect for gathering to meet new friends, play chess or watch a little television. A convenient continental styled breakfast is served in the kitchen and the 1929 GE monitor top refrigerator and the 1929 Oriole gas stove are top conversation pieces. Fresh coffee, a microwave and an ice machine are always at our guest’s disposal. Each room is equipped with a small refrigerator for convenience. nightly & extended rates available! For the comfort and convenience of our guests, smoking and pets are not allowed. This facility is located on the second floor of a 2-story building and does not accommodate small children and is not handicap accessible. The stair case has 29 low-rise steps. Guests can choose from a 6-foot claw-foot tub with shower surround in the main bath or an 8-foot walk-in shower. We provide two guest bath robes per room for your convenience. The Rice Room features the first of our custom-designed hand-stitched harvest quilts on a mission style queen-size bed. A hand-painted mural and coordinated custom designed wallpaper border help set the stage for “rice harvesting” in the ’20s. Quilt maker Barbara Jensen spent more than 175 hours hand-stitching the quilt. This room can be connected to the adjoining Cotton Room for a suite and is the favorite of our honey mooning guests. The Cotton Room features an antique queen-size brass bed and overlooks Evan’s Park. Custom-designed hand-stitched quilt, harvest mural and wallpaper border, as well as antique “Gone with the Wind” style lamps are the highlight of the room that connects to a shared half-bath. This room can adjoin the Rice Room and can be reserved as a suite. The Watermelon Room adjoins a shared half-bath and overlooks Evan’s Park. A hand-painted mural overlooks an antique queen-sized bed with a custom made quilt. The antique ruby “Gone with the Wind” style lamp adds a touch of romance to this colorfully fun room. The Cattle Room offers antique twin beds covered by custom-designed hand-stitched quilts and is the most spacious. It connects to a half-bath for privacy and is a favorite for our visiting duck and goose hunters. VISIT US IN EL CAMPO, TEXAS! © 2018 Harvest House Bed & Breakfast & Instabuild. All rights reserved.